One of those intriguing books about an animal I knew surprisingly little of and a part of the world, eastern Siberia, about which I was completely ignorant. The Tiger is the tale of a singular animal at the end of the 20th century that searches far and wide for one hunter that has done him wrong so he can eat him. In addition to learning how tigers can distinguish and track one human from another for the purpose of avenging past injustices it was equally fascinating to discover eastern Siberia. Here in the forest with winter temperatures routinely forty degrees below zero live both tigers and people abandoned following the demise of the Soviet Union. Survival in the forest is not much different in the year 2000 than it must have been 300 years prior: hunting, gathering wild mushrooms and pine nuts, log huts, and vodka. 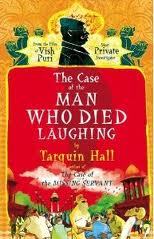 The second in the series of Tarquin Hall mysteries taking place in contemporary New Delhi. In this one our food-loving detective, Vish Puri, whose assistants he has nicknamed Tubelight, Handbrake, and Facepaint, go after the murderer of Dr. Jha, an Indian Guru-buster. Jha, fed up with India’s surplus of money-hoarding Gurus and Swamis makes his living unmasking fraudulent healers until he dies mysteriously while attending a meeting of an Indian laughing club. He perishes during a particularly hysterical knock-knock joke and Puri suspects foul play. Good, bad, funny, pathetic, wild, contradictory, modern, and ancient India are all lovingly displayed in a mystery that seems rather secondary to the main character: India at the crossroads from the 18th to 21st century.